One of the oddest things being Asian and growing up in the South is sitting through US History studying the Civil War period. My ancestors came through LAX, so our people had nothing to do with either side. But it was always interesting to me how a war that happened almost 150 years ago still sparks lively and usually pointed conversation. But, book learning and lively discussion can only teach so much, leaving television - particularly historically-based, million-dollar miniseries featuring fictional dynasties from the North and the South, starring (you guessed it) not one, but several cute boys (Patrick Swazye, Parker Stevenson and James Read, all in uniform, natch) - to fill in the blanks. It's one of the best memories growing up - my family all sitting around the tv gathered to watch this miniseries. Yep. Even my dad! And for every 2-hour installment (and man, were there a lot of them), we'd sit learning more about American history than I did sitting in the classroom - decisive battles, West Point, secession, the slavery/abolitionist debate, major turning points. But more, it taught us about American cultural history - how people sometimes picnic'd on the battlefield sidelines, how the War affected friends and family, soldier life, plantation life, the pretty dresses that women wore, and how dashing soldiers looked on horseback. Ok, ok. That last one's a stretch. 1) The music. The grand and sweeping opening theme song is one of the most memorable of the old-school miniseries. It gets into your head - and I remember humming it incessantly, and trying to sound it out on the piano all the time. 2) Mont Royal, the Southern plantation owned by the Mains. I freakin' loved Mont Royal, and loved the idea of having that long boulevard of oaks approaching the grand house with grand columns and a giant front porch, and acres of land surrounding the house. 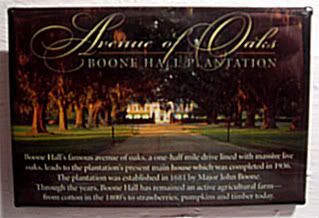 Mont Royal was actually staged at and based on Boone Hall Plantation, where I picked up this magnet. It was the main highlight on a roadtrip from Charleston to Myrtle Beach. How could we not stop? You think television gives you a good idea of what it was like? This living history museum and working plantation rounds out the experience with costumed tour guides giving house and grounds tours. Soooo interesting - I mean, setting aside the fact that it has a somewhat checkered past as a plantation. It can't help that it saw some of the worst days in American history during Civil War. By the same token, it must have seen some of the best our history, too, given that the rows of oak trees were actually planted in 1743, before the American Revolution. Very cool to see firsthand! It's funny that this N&S fansite actually says: "It is places like Mont Royal which [sic] make you say 'I want to live at a place like that.'" My parents apparently took this series and Mont Royal to heart. The house they eventually built? A pretty good match for Mont Royal. hahaha... north and south TOTALLY taught me about the civil war. i mean, really... are you going to tell me abraham lincoln DIDN'T look like hal holbrook???? and that whole brother against brother thing... who doesn't STILL use that phrase! That's how I know Fort Sumter is where the first shot in the Civil War was fired. Heh. Maybe they film another sequel at our house someday, ha?